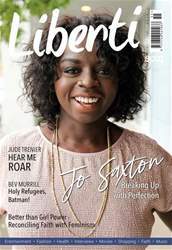 (1 Customer Reviews) | Write Review 4 issues per year Liberti is a dynamic, independent women's magazine with a vision to encourage, equip and inspire Christian women living in today's world.Packed full of celebrity interviews, true life stories, action, sport, gadgets and entertainment. It’s everything you want in a lifestyle magazine and a whole lot more. With the nights drawing in and the extra blankets calling to you, it is a perfect time to snuggle down with out latest Autumn edition. We talk about the courage of women overcoming recurrent miscarriages and speak to the wonderful Jo Saxton on breaking up with perfection plus ideas for Christmas and great upcoming music and books to keep you busy as the days get shorter. Be sure to check out our columns written by the finest team of Christian Writers. Liberti is a dynamic, independent women's magazine with a vision to encourage, equip and inspire Christian women living in today's world.Packed full of celebrity interviews, true life stories, action, sport, gadgets and entertainment. It’s everything you want in a lifestyle magazine and a whole lot more. You'll receive 4 issues during a 1 year Liberti magazine subscription. You'll receive 4 issues during a 1 year Liberti magazine print subscription.